Shop online for 1 maisto plastic models at discounts up to 25%. 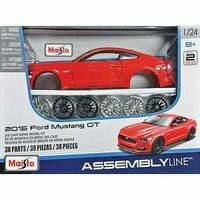 This is a 1/24 Scale 2015 Ford Mustang GT Die-Cast Metal Body Model Kit from the Assembly Line Series by Maisto. Suitable for Ages 8 and Older.